This website is a presentation of our aviation enthusiasts team trying to restore original Douglas DC-9 cockpit and convert it into a flight simulator. On this website you can find information about the aircraft, history of our cockpit, technology which we are using and our project's progress overview. If you have any questions feel free to contact us. Check our photos and videos section for some images. I will post update information on our website as well as to this forum. 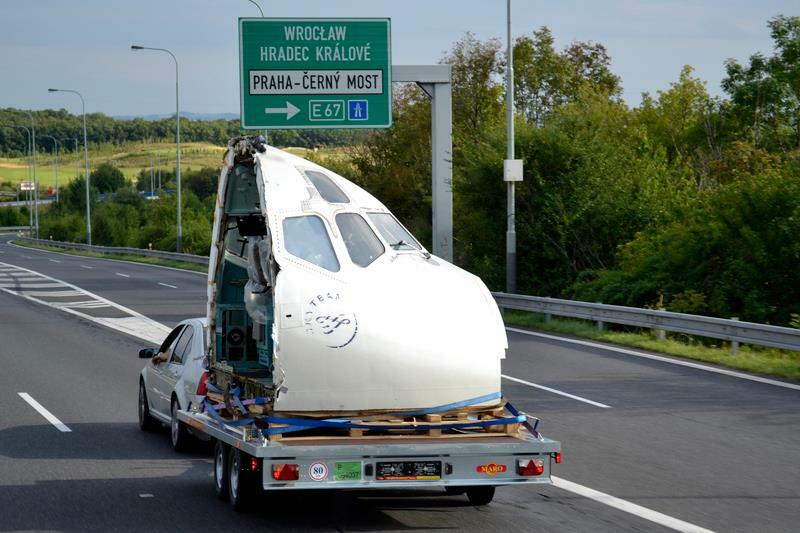 Actually I was not driving - this photo was taken by a photographer from planes.cz website (local planes spotters, something like airliners.net), they put it onto their facebook and started speculating about if it is a photoshoped, or just somebody crazy buying an airliner cockpit :D Then I commented with a link to our project website - funny discussion followed. Sorry I have not written any update here for a long time. Despite the rainy and cold weather we have been working hard in last weeks. We have our DC9 cockpit back home from the fitting workers and our task Nr. 1 is the force feedback. We have bought the stuff from this guy (http://bffsimulation.com/index.php) and using the 40:1 gearbox we have obtained extremly smooth and realistic force in yoke (sofar just the pitch, ailerons will follow). The maximal force is about 20kgs and you really have to use both hands if you want to push the yoke on high speed flight :-) It simulates all the changes of force during flight, runway bumps, and so. Today I am working on the old analog weather radar interfacing and we will hopefully continue with Overhead wiring soon. I wish the day had 50 hours! Hi Pavel, very nice job ! The engine instruments are modified or are drived with simulated "orignal" signals ? The vacuum is electronic controlled (you can set the de-pressure) or at the moment is only... vacuum ? the engine gauges (overhead gauges, APU, whatever) are all controlled by original inner parts. Most of them work as ampermeters or voltmeters so all we need to do is use Arduino for sending PWM signal to them (PWM means that you send fast pulses of voltage/current into them and they display the average value which can be canged by changing the frequency of PWM. Only the EPR gauges (for engines and APU) are special, they are three phase brushless motors so we have to generate the three phase sine sighal by arduino and send it to the coils inside. Currently we are fighting with the fuel quantity gauges which were exchanged in our DC 9 from old analog to modern digital gauges, so we have to power them by 400Hz 115V power source which we have bought but they sense variable capacitance as a signal (not voltage or current as all the other gauges) so it will be quite hard to solve. The pressure gauges work as follows: The company has developed the pressure controller for us which is voltage controlled. It means that you have to send there an analog signal (range 0 - 10V represents altitude 0 - 40000ft) and according to your signal the controller generates low pressure in the instruments (it has inputs from vacuum chamber and from ambient air so all it does is mixing theese two sources to get the right pressure). Again we will use our loved Arduino to generate the signal (it will be PWM signal to generate the 0 - 5V range) and a standard H-bridge to convert this signal to 0 - 10V. Next task will be interfacing of the HSI gauge and radio altimeter which are both hopefully ARINC 526 compatible so we are waiting for V1 Avionics to deliver their converter of Ethernet to ARINC signal. We already have the 115V 400Hz power source from ykpowersupply.com and it works great. -How you generate sin 3phase signas from arduino (Hardware interface) ? I think you need to rise in frequency. At which amplitude the signals are ? - How you drive IAS that need 2 differential pressure ? Hi Paolo! About the arduion output please write an e-mail to our Arduino specialist Jindrich (jima1@email.cz) who will describe it to you. About the IAS gauge: In our airplane we will have 3 complete pressure simulating systems: one for outside static pressure (altimeters), one for inside pressure (cabin altitude), and one for outside total pressure (pitot tubes). The altimeters and varios will be connected to outside static pressure which is low pressure chamber controlled by precission controller as described above. The IAS gauges will be connected to the total pressure system (which is positive pressure generated by compressor and precission controller) and to the outside total pressure. The speed needle moves only according to total pressure input. The barber pole AND the MACH indication move with the help of the static pressure system - exactly as it used to be in real airplane. On thursday we have sent the order to the company which makes this stuff, I hope we will receive all the hardware in few weeks and do some testing and documentation on it. About the ARINC - currently we really did not spend too much of time by working on it, waiting for V1 final product and we will see... Lot of things to do now.